Posted by Average Gay Joe at 4:36 pm - September 16, 2008. 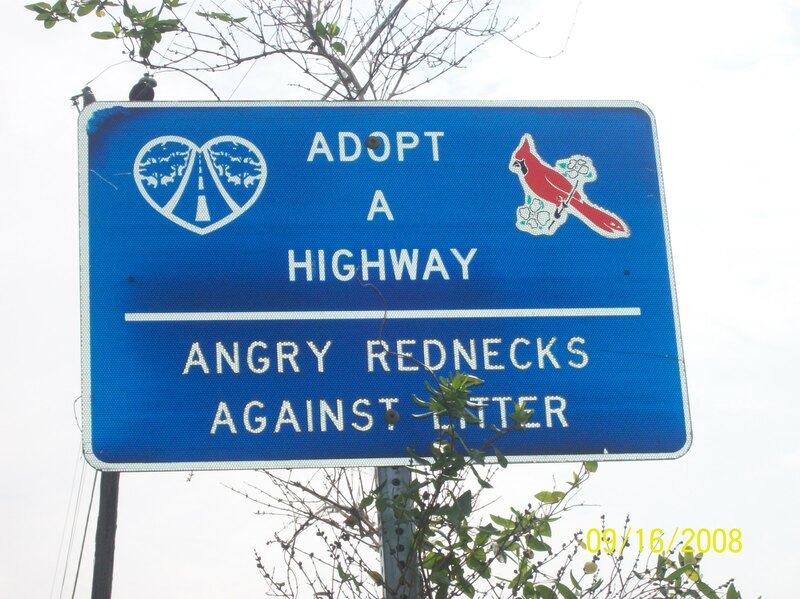 Drivers beware: the Commonwealth is now enlisting “angry Rednecks” into its anti-litter brigades (or are they battalions, Senator Biden?) so throwing trash on the road may become an even greater risk to one’s health! Remember, these “bitter” folks “cling to guns or religion” so won’t have any problem taking care of scofflaws. In the name of Jesus of course. Spotted this sign today on a country road whilst driving around. Pretty damn funny! Angry rednecks are the true environmentalists. And they’re good people. And the sign is frickin’ hilarious. how come i don’t get email from jesus??? 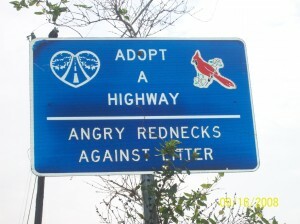 Although I am a very calm redneck, I also oppose litter. michael, why don’t you just ask Him? #2: For the same reason none of your latino ex-boyfriends will speak to you. Because you emptied his bank account and gave him crabs. I now have this as my wallpaper at work. Yomi: I can say from personal experience working with and being friends with such folks that they are no better and no worse than anyone else. Some fit the stereotype of being intolerant, ignorant and violent hicks while others are some of the best folks you could ever hope to meet. It’s all up to the people, John. Your point is valid and well taken. Good show, ol’ chap.